Here is where you will find our latest press releases and other important media. Jan 22 2019- Ross Dodds and Russel Pinkard - West Hollywood, California Ross and Russel share their success story opening and expanding their laundromat empire. Jan 22 2019- Mike Nemetz - Manteca, California Mike Nementz did his homework when he decided to exit corporate America. Jun 1, 2016 - Five Multi-Store Owners Share Advice ACO_BranchingOut_June2016.pdf American Coin-Op interviews multi-laundry owners who share their experience and offer advice. Apr 7, 2016 - PWS Sale Events Breaks Attendance Record We hosted more than 750 attendees combined at our Spring Sales in South Gate, Redwood City, and San Diego. Jun 24, 2015 - PWS Hosts Free Service Schools More than 250 laundry owners attended these educational events, which provided free training on how to maintain and repair Speed Queen washers and dryers. Jun 8, 2015 - 5 Considerations When Purchasing a Laundromat PWS Co-President Brad Steinberg discusses some of the key considerations when investigating the purchase of a laundromat. 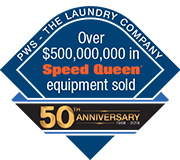 May 19, 2015 - Speed Queen Honors PWS as 2014 Distributor of Year Commercial laundry equipment manufacturer Speed Queen has recognized California-based PWS – The Laundry Company as its 2014 Distributor of the Year. Dec 16, 2014 - LA Laundromat Operator Realizes Multi-Store Dream Read about the design and build process of a brand new laundromat PWS developed.